I've decided my favorite genre of monster is anything that is lying dormant on the ocean floor, waiting to enslave mankind. The joke's on Cthulhu though, because we've already been enslaved by our cell phones. Yesterday, Sharon and I decided to begin celebrating our anniversary by eating lunch at the Cheesecake Factory, followed by a visit to the Body Worlds Animal exhibit. Before we continue, I would like to offer my critique on the Cheesecake Factory. First off, why are the employees dressed like an orderly in a mental hospital? The all white kinda made me nervous, as if someone was going to come to the table and give me a little something to help me sleep. Then I'd wake up in a straight jacket waiting for my turn on the electro shock machine. It's creepy. Secondly, what in the world is going on with the decor? "Tuscan villa on acid" is not a good design choice. The food is pretty good though, so I can't be too hard on them. While we were eating at the Cheesecake Factory I noticed a young couple, probably in their 20's, at an adjoining table. The only time they put their phones down was when it was time to eat. No conversation whatsoever that didn't involve talking about how they liked their food. Then as soon as they were done they were back on the phones, completely ignoring one another in favor of seeing what everyone else was up to on Facebook. Is this really what life has come to? If so, whenever Cthulhu makes his way to land he's gonna be sadly disappointed with the state of things. At best he'll trend on Twitter for a day or so, probably get a ton of uploads to Instagram, and then he'll be forgotten. Cthulhu: "I am here to enslave mankind." Mankind: "That's a pretty boring status update, so, like, I'm just gonna play Candy Crush until my retinas melt." Cthulhu: "But, you don't understand. I have risen from the depths to rule once more over this world." 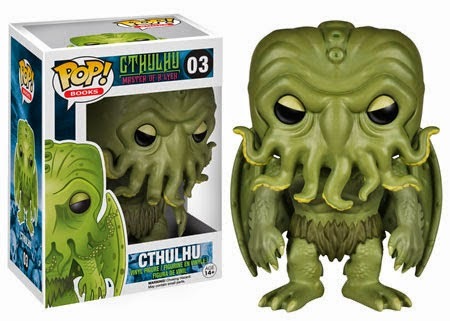 But as a consolation prize, the Old One will be forever immortalized in Pop! Vinyl form by Funko this January.